Publication History: This article was prepared especially for "Crain's Petrophysical Handbook" by E. R. (Ross) Crain, P.Eng. in 2005, updated 2011, based on numerous Internet Sources. This webpage version is the copyrighted intellectual property of the author. Dynamic elastic constants can also be determined in the laboratory using high frequency acoustic pulses on core samples. 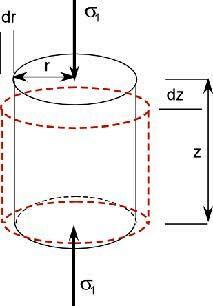 Static elastic constants are derived in the laboratory from tri-axial stress-strain measurements (non-destructive) or the chevron notch test (destructive). Where F/A is the force per unit area and dL/L, dV/V, and (dX/L) = tanX are the fractional strains of length, volume, and shape, respectively. Velocity of sound, density, and elastic properties of rocks are intimately connected by a series of transforms. Knowledge of any two of these properties means all the others can be calculated. To translate these formulae into metric, convert density into gm/cc, velocity to Km/sec and the various moduli to megabars, and change the constant terms to 1.0. To convert moduli in megabars to psi, multiply by 6.89 * 10^-6. To convert megabars to Kilopascals, multiply by 10^4. The elastic constants K, N, Y and PR are often known, and many values are listed in handbooks. Identities exist which show that knowledge of any two constants infers knowledge of the other two. This in turn, infers knowledge of velocity. These identities follow. R2 and R3 are as defined before. By rearranging all of the above, density can be found in a large variety of circumstances. 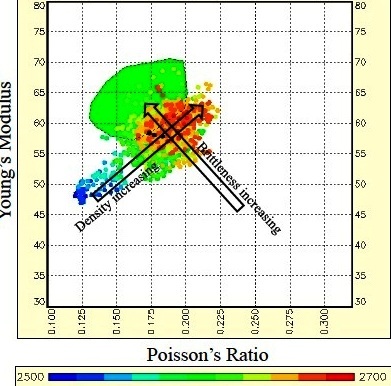 Such relationships are used to reconstruct density logs in bad hole conditions by using sonic log data and assumed values for Poisson's ratio. PR is often a function of shale volume and lithology, which can be determined in zones where hole condition is good. Considerable data is available on elastic constants versus pressure. Three methods are available for tabulation of results and are covered in the Handbook of Physical Constants. The constants a and b, for particular solids can be found in the Handbook of Physical Constants. The Cij and Sij values are obtained from the tables in The Handbook of Physical Constants. 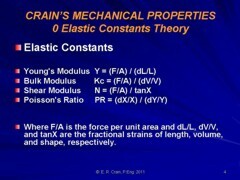 Other coefficients for the aggregate may be obtained from K and N, by use of the relationships between the various elastic constants given earlier. Examples of these two methods are also shown in the Handbook of Physical Constants. For many rocks, elastic constants are known, whereas velocity is unknown. This is especially true when the effects of pressure and temperature are being considered. It is also clear that given a reasonable set of elastic constants and either a velocity or density log, the other log can be constructed with confidence. This is particularly useful in seismography. Note that the sonic velocity log as a rule, measures the travel time associated with the longitudinal or compressional wave. Therefore, the appropriate equations should be used for log interpretation work.